1. Once all of the corrections are made to the pattern, you are almost ready to cut out your garment from your beautiful fabric. Your fabric should be prewashed and pressed already. Hopefully you have straightened the grain using the information from Sewing.org (opens PDF file). I will mention that some fabrics have a finish on them that prevent you from straightening the grain. If you try and fail, then the fabric is going to be stable enough and you shouldn’t make yourself nuts worrying about it. 2. For most patterns, fold the fabric in half lengthwise with the wrong sides out. Each pattern will have a cutting guide on the direction sheets that will help you determine the best way to prepare your fabric for cutting. Pin the selvages together about every 2-3” so that the fabric doesn’t shift as you work. The folded edge should be smooth, with no ripples. Whenever possible, I place all the pieces in one direction, as if the fabric had a nap or one-way design. If you want to check your fabric to see if it will make a difference if the pattern is placed in opposite directions, fold one end back on itself and see if you notice a difference. In the photo, if you look carefully, you can see that when I fold the fabric back, the bottles are in different directions. (I would not use this fabric for a dress, but it makes a great illustration!) When you try the fold test, if you see any difference in print or texture, then you should lay all the pieces in the same direction. 3. Finding a place to cut can be a challenge. Try to find a place that is flat, firm, and long enough to hold the entire length of fabric. Sometimes the floor is the best place, although it can be hard on your back and knees. The importance of being able to hold the entire length of fabric is that the fabric doesn’t stretch or pull as it would when extended beyond the length of a table. 4. When placing the pattern on the fabric, before pinning each piece or anchoring with weights, use a ruler or yardstick to measure the distance from the selvage to the grain line. Do this on at least two points to insure that the pattern piece is on the grain line. It is sometimes helpful to use a ruler to extend the grain line the full length of the pattern piece. Having your garment cut on the correct grain line will make a huge difference in the way that hangs when it is finished. 5. When cutting, hold the scissors perpendicular to the table. 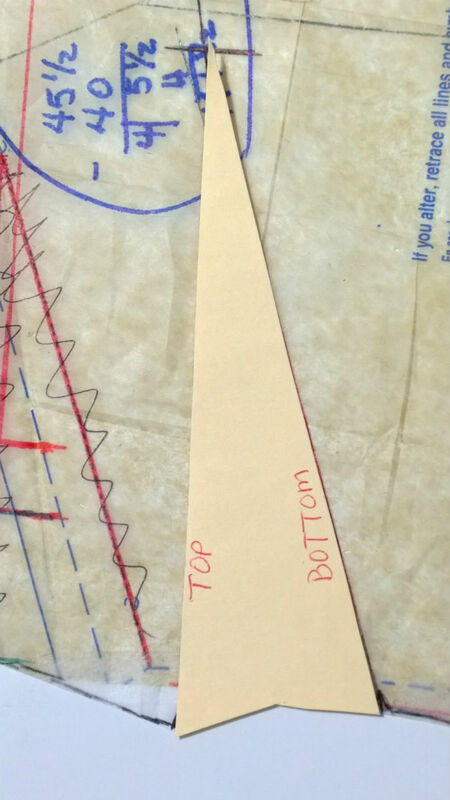 (Think right angle) Even a slight tilt can add or subtract fabric in the seam allowance. Keep the bottom blade in contact with the table so that they glide as you cut. Take long, full cuts instead of short choppy cuts to prevent jagged edges. Do this by opening and closing the blades fully with each cut. The hand not holding the scissors should move along closely to hold the fabric as near to the table as possible. Move yourself around the cutting surface as much as possible, rather than repositioning the fabric. Moving the fabric can distort your careful layout. Whenever possible, the scissors should be between you and the line you are cutting. Reaching across wide areas can distort the cutting lines. 6. After cutting out the entire garment, transfer all pattern markings to the WRONG side of the fabric before removing the pattern. These markings may include: darts, notches, and dots. Do NOT attempt to mark all of the stitching lines. You will use the guide on your sewing machine for that. A quick way to mark is with a tracing wheel and carbon paper. Before doing so, test the carbon on a scrap of fabric. If the markings are visible on the front side, this may not be the best choice. Other options include tailor tacks and/or templates. Most any sewing book can explain how to make a tailor’s tack, or go to Sewing.org to read about marking tools (opens PDF file). Then use a chalk pencil to trace around the template. It takes a little more effort, but doesn’t show on the right side of the fabric. A note about marking notches: many beginning sewists have been taught to cut around each notch. This takes a lot of time and energy. Simply continue cutting a line around the pattern piece, and then using scissor tips, cut a small clip at each notch. The clip should not exceed ¼” into the seam allowance. Once a seam finish is applied, it will not be noticeable, nor will it weaken the seam. 7. The final step before heading for the sewing machine is to apply interfacing to the pieces that need it. 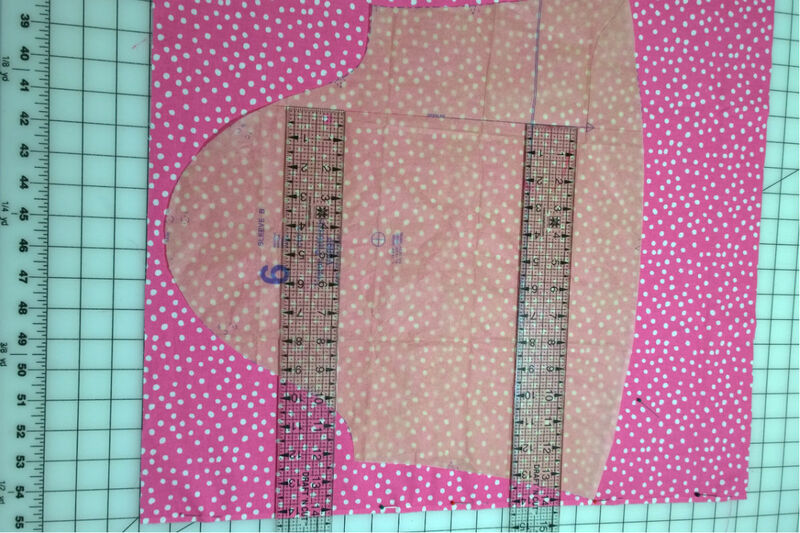 For this pattern, only the front facing will require interfacing. 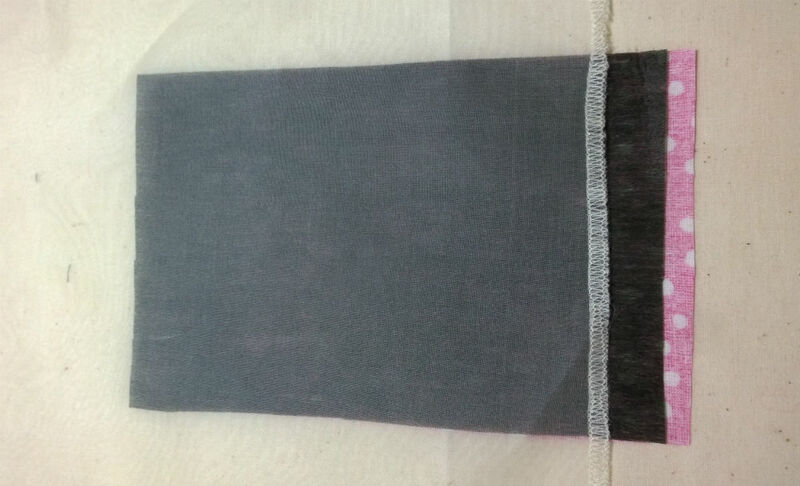 If you use fusible (iron-on) interfacing, test it on a scrap of your garment fabric before applying it to the facings. Always use a press cloth under and over the interfacing to prevent making a mess on your ironing board. A piece of muslin will work just fine for both areas. If you want to have better visibility, use muslin underneath and silk organza on top. Notice the “sandwich” that I create. (I used black interfacing so that you could see it easily. 8. At this point, we are ready to sew. Before we begin, I would like for you to consider the steps we have taken so far. We have adjusted the fit of the pattern, and we have cut out the garment. When each of these “strands” is of good quality, you will create a garment that you can be proud to wear. Have you ever seen a braid in which each of the strands were not comparable? It looks lopsided and is not very strong. Please don’t take shortcuts in your sewing methods. They only serve to weaken your “braid”. Use this contact form to ask Louise and Maggie questions about the Sew Along. Your Sew Along work-in-progress pictures can be sent to sewalong@planoasgsews.org or uploaded to our Facebook page.